Memoirs of a Chocoholic: Bad Dog! J: "Excuse me,... is there a table booking here for Patrick or Leonard? I'm meeting friends." Waiter A: "Harr. WHO? Who is that? What do you want?" J: "Well,.. I'm here for dinner. I'm meeting friends. They usually book the table." Waiter A: "Don't have. You don't see them here? *grunt* Maybe upstairs. *points at stairs and walks off*"
Is this what they call "service" in this joint? J: "Excuse me, can we have more menus to look at please?" Patrick: "Huh? Your whole restaurant only has 2 menus?." Waiter B: "Upstairs no more." J: "Erm, ...*waves hand at waiter* ... excuse me. Are you still taking orders?" Waiter B: "*evil eye to J* ... Yeaaa-AH!" However, one thing's for sure: they are nice people who don't give a flying fish about customer service. Oh man, I have griped a LOT already.... I think I'd better actually review the food. 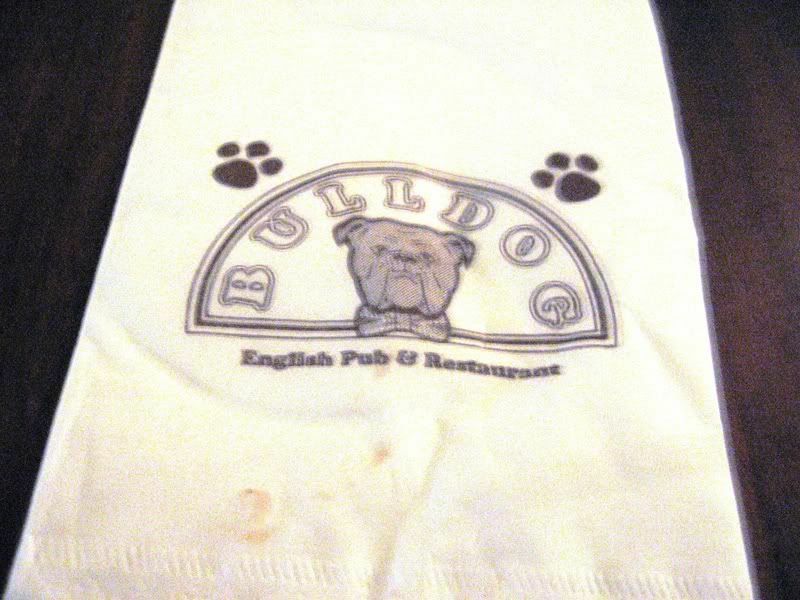 The food at The Bulldog is down to earth, typical English pub fare so you can expect stuff like Pies, Fish and Chips as well as England's national food: The Chicken Tikka Masala. 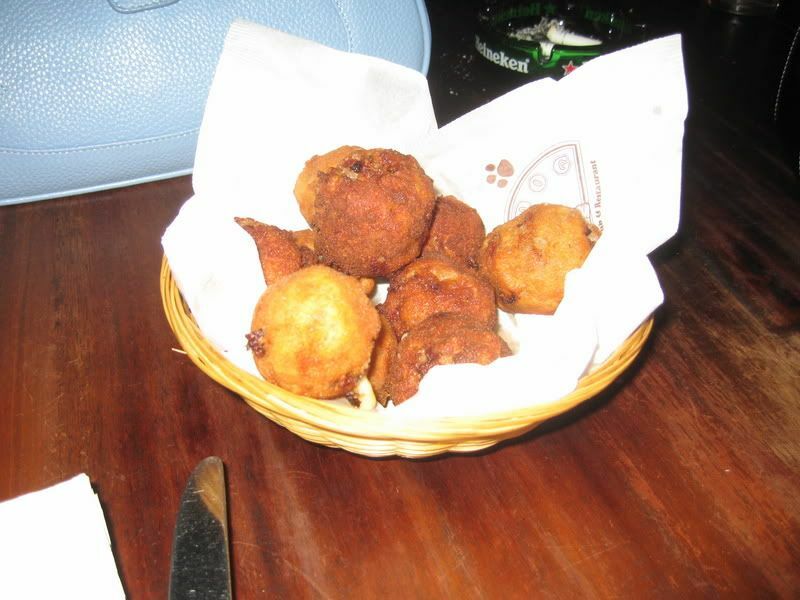 The beef meatballs, deepfried with a little cheese inside, were generally overcooked, with a distinctly dry texture. 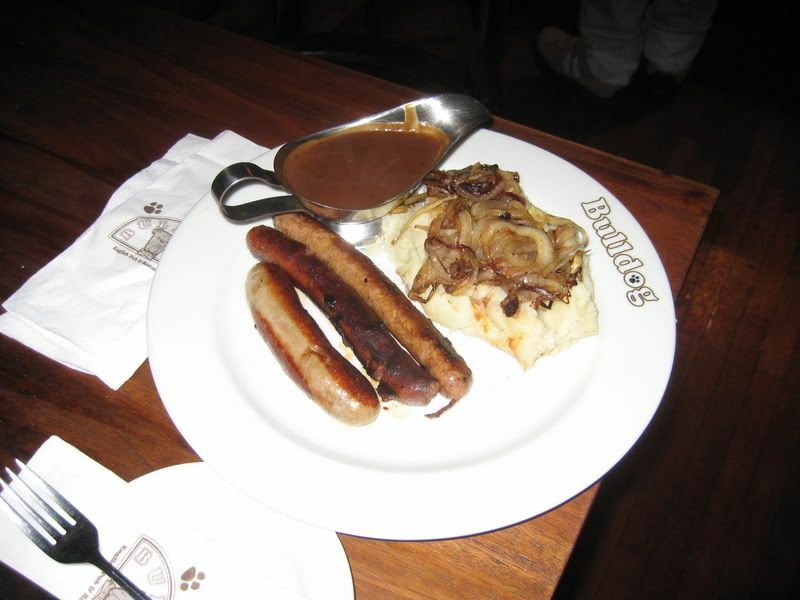 The Bangers and Mash, with a choice of either pork, lamb or beef sausages served with a generous amount of mash potatoes, is one of The Bulldog's specialties. It was ok, worth a try: the mash was nice but the sausages are similar to those that you can get from gourmet delis. The Shephard's Pie, minced lamb in a tomato herb sauce, topped with gratinated mash potatoes, was ok. The mince was a little dry but did not have that "lamb-y" taste so I guess it was slightly above average. 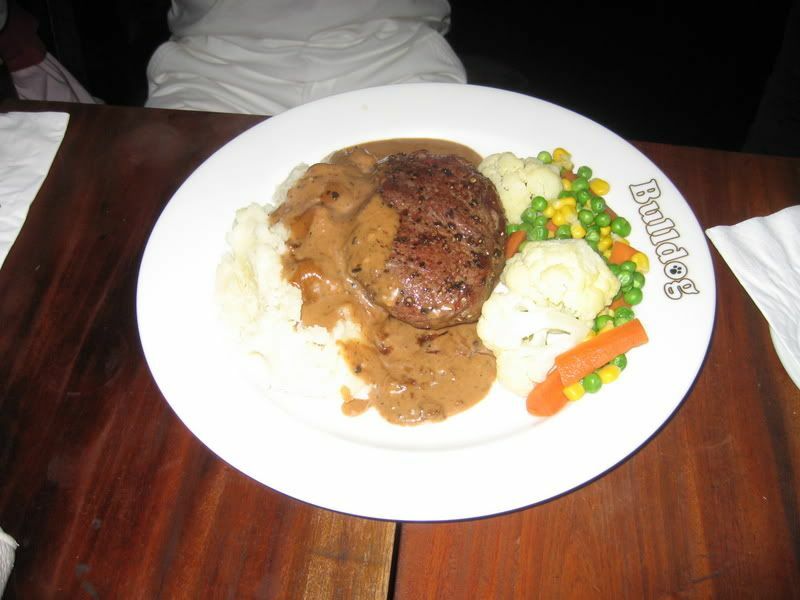 The Steak was not bad, I guess - ok flavour and ok texture but nothing extraordinary. Not much else to comment. The Yorkshire Pudding was, also only ok. The pastry was tasty but the beef was dry. 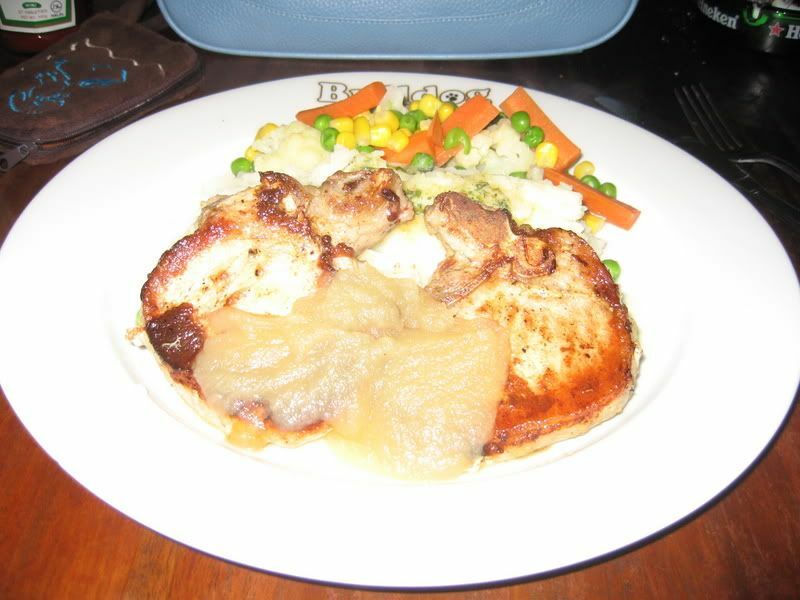 The Pork Chop served with mash potatoes (my order on that night) was a disappointment. The meat was (AGAIN) dry, and relatively tasteless - in fact (as Jo-lyn rightly pointed out) the accompanying apple sauce totally overpowered it. Anyway, if nothing else, the servings were generous so I was too full to try any dessert. So it's: Unpretentious dining,in an English Pub setting, quite generous serving sizes BUT didn't taste that great and bad, BAD service. hmmmm, as long as the service is bad, i'm boycotting the place. normally if i'm faced with that situation, i'd complain to the person in charge. write a complaint to management! Yeah, heard abt this place and the only highlight is they serve pork. My friend said don't bother trying as she thought the food was mediocre only. J, if u love steaks go try Prime at Le Meridien. Very nice! If u want a budget meal, try their set lunches (rm55++ to RM80++) and they are giving 15% discount for food items if u pay by Visa. That is the main problem with non-tipping societies, rude waiters. As much as I hate brainless waiters, I would take one over a rude waiter anytime. I usually would too but that night, I just didn't know where to start! Maybe I should just print out the review on my blog and mail it to them. Glad to see that my post has some positive effects! Will put it on my list and try it soon! So, is it a Chicken + Egg situation? If we become a tip paying society, does that necessarily mean that we will get better service from waiters? It's easier when it is a small group, but with >8 ppl (and the extremely bad service only affecting about 50% of us), it was hard to mobilise everyone. In fact, shockingly, some of my friends actually found the place OK..! When will these restaurants learn that the key to success is CONSISTENCY and quality?? 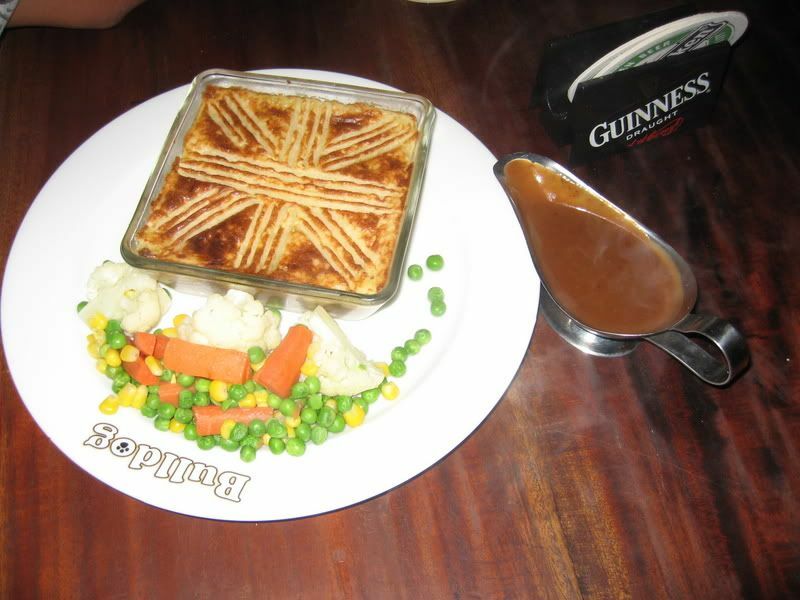 English food tastes like that. 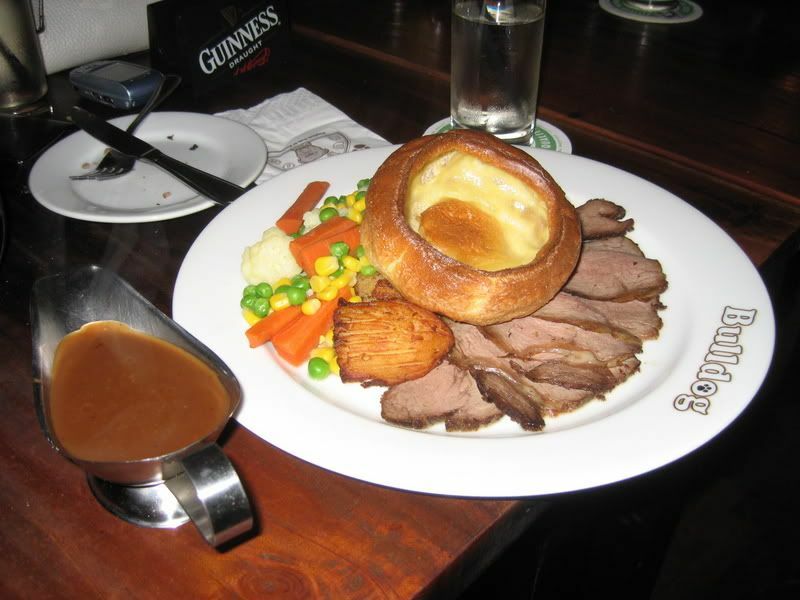 Its perfectly normal for roast beef to be as dry as dust and/or steaks to be as tough and tasty as a slab of cardboard. At least the place was authentic! Is bad service another key to authenticity too? Maybe I should relook at my review and add points. I enjoyed the band very much. MY experience was good...but just a bit too crowded on Fri night. I thought the band and bar area was quite ok too (from the little time that I spent there)... It does seem to be quite popular! Bulldog ROCKS!!! 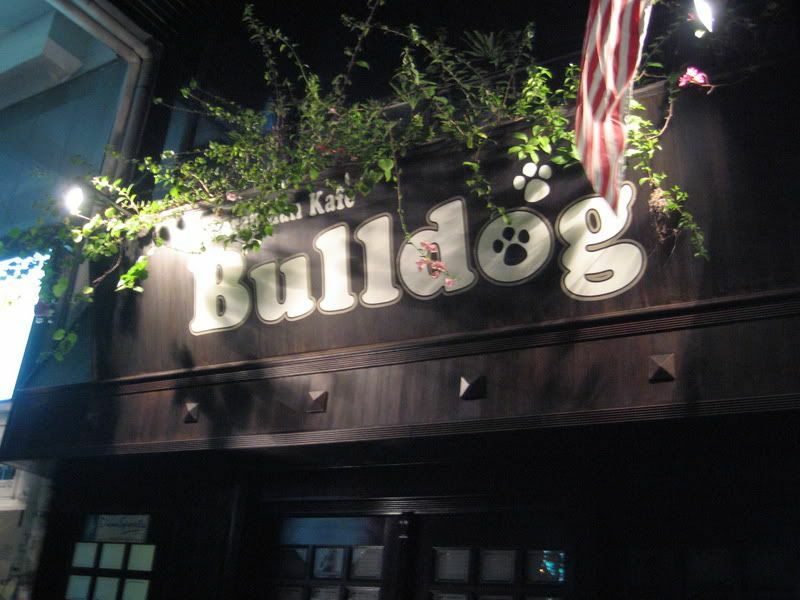 The Bull dog bacon nachos is the BEST I have ever tasted. Well.. the waiters could be better... but once you get to know them and are regulars... you are treated well... its a nice place to hang out and the live bands are awesome!.. its like a Cheers Bar... once you're a regular.. everyone is FAMILY!! They have less variety on the menu at Sid's but the taste is nice, the drinks are cheaper than most places and the waiters are nice to everyone. I guess the only downside is that Sid's does not have a live band (as far as I know). Sid's? Nice Place except for one particular Indian manager. I think its Michael or something. 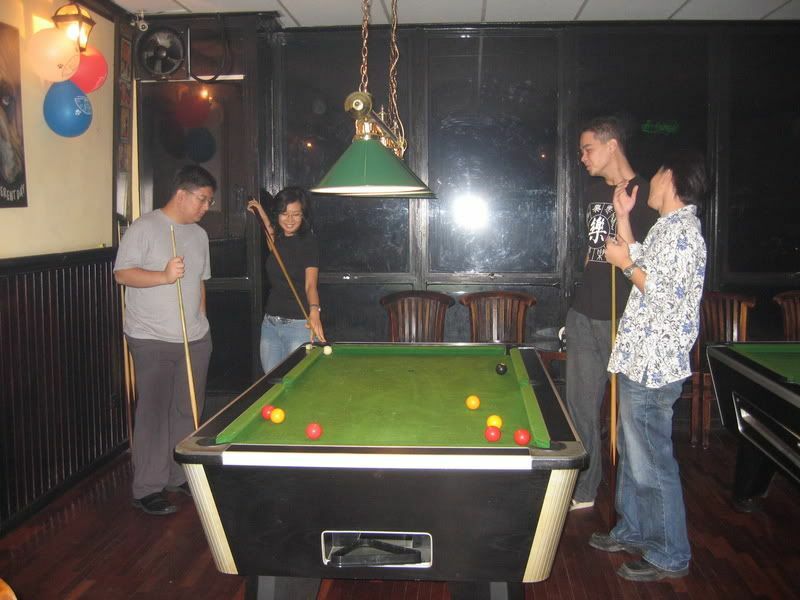 Heard some friends said that the owner's brother made some racist comments bout chinese one day. Guess its nice on the outside but dont know what is actually in the inside .Hate racist foreigners. Well,... I've never had anything bad done or said to me there.